Creating restaurant-style presentations just got easier. This easy-to-use julienne peeler allows anyone to quickly create perfect looking veggie strips thanks to the advanced design and super sharp blade. It's made entirely of stainless steel, so it has a great look, and rugged durability. This aspect also makes it easy to care for because it is totally dishwasher safe. Add zip to salads and authenticity to stir fry dishes with uniform strips of shredded vegetables. Dress up your desserts with julienne apples, lemons, orange peels, or even chocolate. Because the blade has teeth instead of a straight blade, it removes thin julienne shreds instead of a solid strip of peel. Size will vary slightly depending on food type, and pressure applied, but the superior construction makes it easy to get professional results. Most of us don't have the time or patience to cut vegetables with a knife, and using a grater produces much thinner results. Thicker, more uniform pieces create a really nice look, and can be essential to certain recipes, but most people avoid at all costs due to the hassle. This tool removes all of the annoyance because you can quickly make garnish, top salads, shred cucumbers, zest citrus and more. The ridiculously sharp teeth can be used on any firm fruit or vegetable, and with little effort, anyone can peel perfect strips. If you are tired of those awful bags of dried-out, pre-shredded carrots and want a fresh alternative, this tool is a great choice. You can buy carrots in bulk at a lower price, and slice them as you need them for your salads. The blade portion of this tool has two parts instead of one. 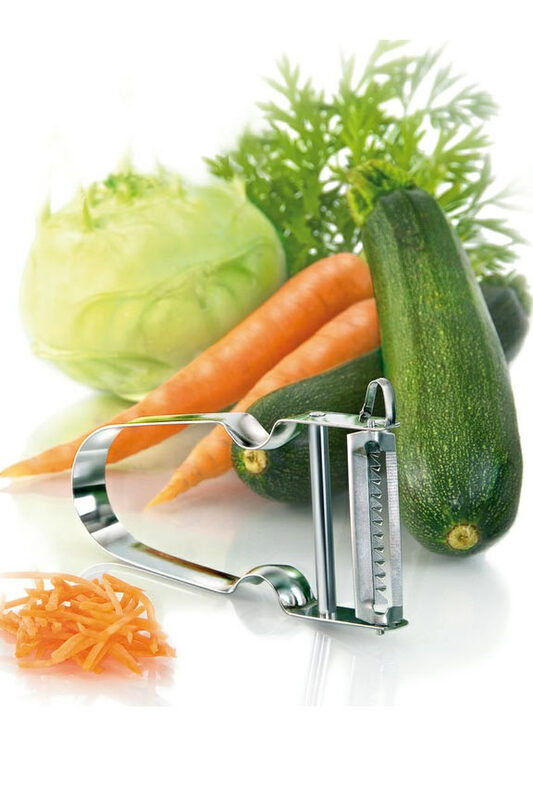 There are many razor sharp teeth, and they cut your vegetables to create the strips, but there is also a straight metal edge that lifts the strips up and away from the veggies to remove them. This makes the whole process quick and easy. Simply place your vegetable of choice in front of you and hold it firmly with your non-cutting hand. Place the peeler in your other hand, and press the teeth directly against your veggie. Pull firmly toward the opposite end of the vegetable to peel multiple strips at once. Once cut, your shreds should fall beneath the tool. For best results, and maximum safety, always peel away from your body. Rotation is recommended. It's possible to use a whole carrot, or cucumber without leftovers if you keep things even. Repeat as desired to produce the amount you need. Thanks to the blade and handle design, you will get perfect results each and every time. Looking for a powerful tool for regular peeling? Check out the Original Star Vegetable Peeler. It looks the same, but has a traditional, straight blade. 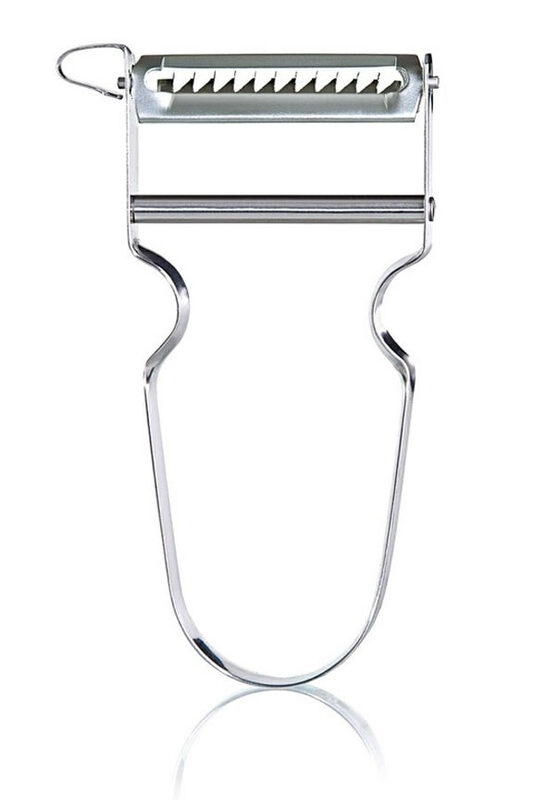 TheSerrated Peeler by Zena is nother specialized tool that is ideal for tomatoes and fuzzy fruits. Want all three? Then check out the Star Trilogy. It's a three piece set that includes one of each. Order Yours Today! Eat healthier and show off your cooking talents with this easy-to-use kitchen gadget. It is sharper and easier to use than other, similar tools, and it's great for left handed people or those with arthritis. Order Yours Today. The julienne peeler is excellent and does the job, and easy to use and doesn't take up a lot of room. Easy to use, top quality, it is the Best of the Best. 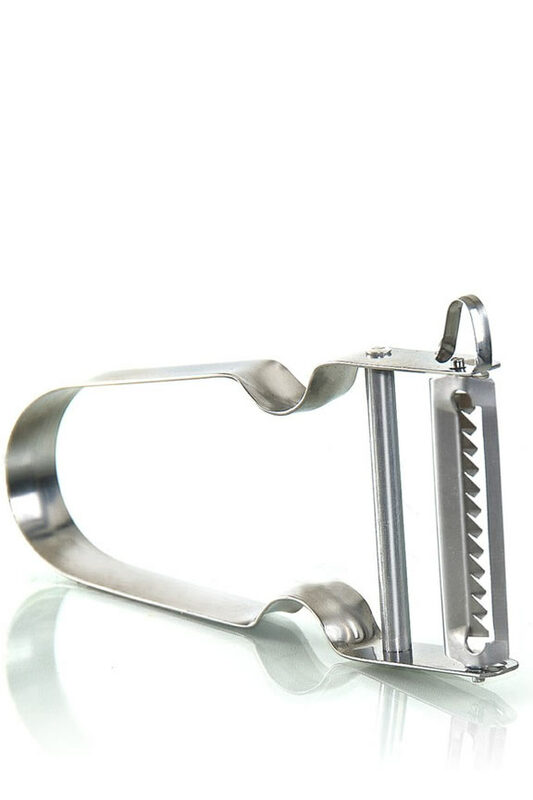 I've been using the star julienne peeler to make zucchini pasta. It cuts my prep time in half. Highly recommend it! Why I found good stuff in the first place. I could not find one in a store locally. Good reviews and price led me to try one. Works as advertised!!! I liked it enough to buy several more as gifts. Having had it a short time and not used a lot , I can't speak to how long it will last but I like the all metal construction and it is sharp.